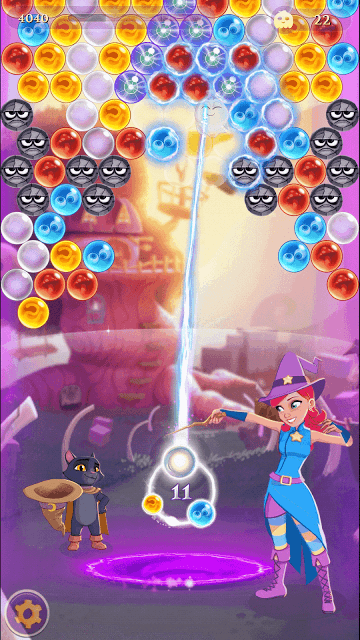 King’s Bubble Witch 3 Saga throws several new features that will keep new and seasoned players busy for hours. Besides an improved aiming line, the game offers some really cool levels, such as rescuing adorable owls, escorting a cute ghost safely back to his parents etc. You may have noticed that the ghost finds his own way up when he sees a space between bubbles. Create a gap through a chain of bubbles by popping as many bubbles as possible in one move. Look for bigger matches when the game starts. Target bubbles close to the ghost. When he moves up, the entire cluster of bubbles automatically comes down, making the first line of bubbles crash against the white arc and drop into the cauldron, so you don’t have to worry about clearing the first line of bubbles. The ghost is pretty smart and will find the best route on his way up; you just have to focus creating a path for him by clearing bubbles near him. You can easily shoot bubbles through the ghost, so don’t worry if he comes in between your shooter bubble and your target. Just point the aiming line to your target and it will go through him. Many times, it will be difficult for you to clear rock bubbles as they will be clinging to normal bubbles that are pretty hard to reach. The best strategy to clear them is to bank shots off a wall so that you can clear normal bubbles and make rock bubbles fall into the cauldron. You can also use Nero’s special bubble to destroy them. 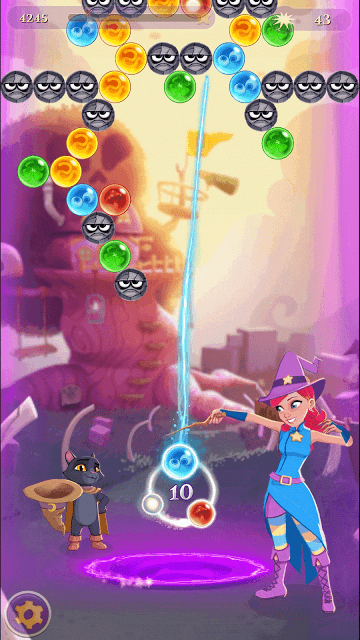 While there’s no cheat to get unlimited lives in Bubble Witch 3 Saga, there’s one proper way to get them. Get 2-3 stars in every level to convert them to star dust. Every star you earn is added to the stardust bar at the bottom of the screen. When the bar is full, you will get 1000 stardust. You can spend them to renovate Stella’s home. You will have to renovate at least 3 smaller items to fill the rewards chest bar to unlock the chest. The chest may contain unlimited lives, which lasts for an hour or so. If you get one, then make the most of it and try to complete as many levels as possible. Besides lives, you may also get spells that will help you destroy more bubbles in one move. Winning levels to earn stars is the best way to get stardust. But there’s another way to get them. You will have to visit other players’ houses and tap on glowing fairies to get them. To get access to a random player’s home, tap on Stella’s home on your map screen, and then tap on a player profile pic on a bottom of a pic. Tap only on those profile pics that have a dancing potion bottle icon to get free star dust. Come back every hour to get stardust. While playing this game on your Android phone, press the home button to “minimize” the app. Go to Settings > Date & Time and turn off “Automatic Date and Time” by moving the slider to the left side. In the “Set Time” section, move the clock hour/minutes ahead as per the time remaining to get lives back. So if it takes 25 minutes for a refill, move the clock at least 45 minutes or an hour ahead. Don’t set the exact time. You will be notified that all lives have been refilled. But if you set the time back to “automatic”, you will lose refills. You can try this cheat, but then you won’t be able to set the time back to normal. It can be very difficult to get rid of those bubbles that can’t be matched. However, you might find them clinging to a cluster of same-colored bubbles. Such same-colored group of bubbles can be found positioned high above them and are usually hard to reach. In such situations, banking shots off the wall can make it easy for you to slide into such areas and match bubbles. You will have to set the aiming line on the left/right wall so that the shooter bubble hits and bounces off a wall to reach its target. The angle of your aiming line is important, and thankfully Bubble Witch 3 Saga features an improved line, so banking shots off the wall won’t be too hard this time. You will have to use this trick frequently because most levels have those pesky rocky bubbles that can’t be matched, unlike colorful ones. 7. When Should You Use Nero’s Special Bubble? “Nero’s Power” is one the best features of this game. You will need to match bubbles to charge the Nero’s special bubble. Once full, a new sparkling bubble is created. You can use it to destroy a small cluster of bubbles. The best part about this is that one does not have to make a color match – Just aim and shoot to destroy a group of bubbles. To fill Nero’s crystal bubble faster, you will have to tap it and any bubble loaded onto a shooter will be dropped into it. Do remember that you will need to drop 5 shooter bubbles to charge his special bubble. That’s quite a lot considering the fact that you will have limited number of bubbles. Try to fast-charge the special bubble only when there are too many black bubbles blocking normal ones or when you find a sweet spot that can drop several bubbles at that same time when hit. Blyss Review: Joining Dots Was Never This Fun!